In response to the outrages claims made in the BBC 2 programme that the prophet (saw) was ‘allegedly’ tempted by the devil and as a consequence accepted in acknowledging the idols of the quraish, but later changed/abrogated the ayahs (verses). which according to many non – muslims (and as the narrator said it) to mean that the Quran is fake and not the word of Allah. Simply because it was changed at will. – NAUZIBILLAH! Bellow is a section from Qadi Iyad’s famous ‘As Sifah’ on this issue and what his response was to this absurd claim. “Here is an issue that the enemies of Islam fish out the toilet every now and again to cast doubts into the hearts of the believers and potential Muslims to be. This is not a new claim that originated with Salmun Rushdie. No, in fact the enemy of Islam Muhammad Ibn Abdul Wahhab also used the same arguement in his Mukhtasar Seerat ur-Rasulillahi. So it is nothing new. However, by the grace of Allah this argument has been totally demolished, but before we get into that I would like to provoke some thought about preservation of history. Robin Hood is a world famous character. Loved and treasured. We have seen many films and cartoons made about him, yet when we study Robin Hood as an historical figure, we find discrepancies in the historical accounts. Even some historians considered him a highway robber, a cut throat thieve. However, the historical works when all laid out and placed under the microscope of examination all fail the test of authenticity and have no transmission to where such and such historical accounts can be attributed. In fact, we will find that the mystery figure of Robin Hood to be nothing more than a myth, and cannot be proven by fact. We cannot say this about Prophet Muhammad sal Allahu alayhi wassallam, the one who said: “The best of generations is my generation, then the one after that, then the one after that. After them will appear untrustworthy people” Saheeh al-Bukhaari, The book of the Merits of the companions of the Prophet sal Allahu alayhi wasallam, Volume 5, hadeeth no. 2 and 3, also of simular import in Saheeh al-Bukhari, The Book of Witnesses, Volume 3, Number 820; Volume 8, The Book of ar-Riqaaq, Number 437 and more. We see from the three above Ahaadeeth that the knowledge’s of Islam, including biography and history, would be preserved and carried forth by the trustworthy scholars, but yet the Prophet sal Allahu alayhi wasallam also warned us that there would also be untrustworthy people. “The Religion is isnaad [authentic unbroken transmission], and if it was not for isnaad, people can say whatever they wish [about this deen]”. Therefore we should only take reports about our religion from the righteous known revivors of each century who have had the knowledge passed down and preserved through them. (The above words in quotation marks were the few remarks of the brother who kindly put this piece of invaluable information together. May Allah reward him immensely – Amin). “ln this section we will deal with certain questions posed by calumniators. and then added, “Those are the high-soaring cranes whose intercession is hoped for.” Transmitted by Ibn Jarir, Ibn al-Mundhir and Abu Hatim with a broken isnad from Sa’id ibn Jubayr. When the Prophet finished the sura, he prostrated, and the Muslims prostrated and so did the unbelievers since they had heard him praise their gods. One of the transmissions says that Shaytan cast it on the Prophet’s tongue while he was hoping for something to be sent down on him to bring his people nearer. Another version says he was hoping that nothing would be sent down on him which would alienate them. Know that we have two approaches for discussing the problems posed by this hadith. One approach considers its root to be weak and the other considers it sound. As for the first approach, it is enough for you to know that this hadith is not related by any of the people of sound hadith, i.e. the authors of the Six Books, nor does anyone reliable relate it with a sound direct isnad. It is only commentators and historians who are fasci nated by strange things, be they sound or faulty, that are fond of this kind of thing. Qadi Bakr ibn al-‘Ala’ al-Maliki spoke the truth when he said that people were put to the test by some sectarians and commentators and the heretics con tinued to adhere to the story in spite of the weakness of its transmission, the disarray of the various versions of it, the gap in its isnad and the discrepancy in its words. One variant says that it took place during the prayer while another says that it was sent down on him while he was summoning the people. Another says that he said it happened while he was sleepy and yet another says that his self spoke to him and made him forgetful. None of the commentators who relate this story, Like Ibn Jarir, Abu Hatim and Ibn al-Mundhir, nor the Followers, Such as az-Zuhri and Qatada, gave it an isnad or traced it back to one of the Companions. Most of its paths of trans­mission are weak. As for the implications, it has already been clearly shown, proof has been established and the community is in agreement that the Prophet was protected and free from things like this, both from any desire for something like this to be revealed to him, in which there is praise for other gods than Allah – which is disbelief – and also from Shaytan being able to overcome him and make the Qur’an obscure to him in such a way as to make him put in it what is not actu ally part of it. It is not conceivable that the Prophet could believe that some thing which was not part of the Qur’an was part of it so that Jibril would have to inform him of it. All of this is impossible for the Prophet. It is impossible for the Prophet to have said this from himself intentionally. That would amount to either disbelief or forgetfulness and he is protected from both these things. It has been confirmed both by proofs and by consensus that the Prophet is protected from any disbelief coming into his heart or onto his tongue, either intentionally or through forgetfulness, or that what the Angel cast into him should resemble anything that Shaytan can cast, or that Shaytan should have a way to get to him, or for him to forge lies against Allah intentionally, or through forgetfulness regarding something that had not been revealed to him. The second point to be made is the general impossibility of this story. If these words had been as they are related, it would have been incongruous, con tradictory, mixing praise and censure, and feeble. That would not have been hidden from the Prophet and the Muslims and leaders of the idol-worshippers who were with him. It is not concealed from the most insignificant person who reflects on it, so how could it have been hidden from people who had great knowledge and were thoroughly versed in the science of eloquent, sound Arabic? The third point is that it is known that the habit of the hypocrites and the idolworshippers, those who were weak of heart and the ignorant Muslims was to bridle at the first opportunity. His enemies would use the slightest excuse to cause confusion about the Prophet and abuse the Muslims. They gloated over them time after time. Those with a sickness in their hearts who had professed Islam abandoned it at the least doubt. There would have been no temptation or trial greater than this affliction if it had really occurred. There would have been nothing which the enemy would have used to provoke dissension more than such an event if it had been possi ble to do so, but not a single word of it is related, neither from the recalcitrant nor from any Muslim. This shows that the whole story is false and not to be accepted, and there is no doubt that one of the shaytans of men or jinn foisted this hadith onto one of the heedless people of hadith in order to cause confusion among weak Muslims. were sent down about it. These two ayats in fact refute the tradition they have related because Allah says that they only very nearly beguiled to make him forget. If it had not been that He had majde him firm, he would have relied on them. “The radiance of His lightning nearly snatches away the sight.” (24:43) It does not in fact do so. When “He nearly hid it,” He did not do so. Qadi al-Qushayri said that when the Prophet passed by their gods, Quraysh and Thaqif tried to make him look at them and promised him that they would believe in him if he did. He did not and would not do it. Ibn al-Anbari said that the Messenger did not go near them nor rely on them. Other tafsirs on the meaning of this ayat have mentioned what we have mentioned regarding what Allah said about His Messenger being protected which shows that this matter is without basis. All that remains to be learned from the ayat is that Allah strengthened His Messenger by protecting him and making him firm regarding what the unbe lievers were about to do when they wanted to beguile him. What is meant by that is that the Prophet was protected and free from it. This is what should be understood from the ayat. The second approach is based on considering the hadith to be sound. In which case, the Imams of the Muslims have different responses to that, of vary ing strengths. One from Qatada and Muqatal is that the Prophet was dozing when reciting this sura and these words flowed on his tongue as if he were asleep. This would not be not valid for the Prophet in any of his states nor would Allah have creat ed that on his tongue nor could Shaytan overcome him either while asleep or awake because the Prophet was completely protected. Al-Kalbi said that the Prophet was speaking to himself when Shaytan said that on his tongue. In Ibn Shihab’s version from Abu Bakr ibn ‘Abdu’r-Rahman, he said that he forgot and when told about it said that it was from Shaytan. All of these things are impossible for the Prophet in any state. Shaytan has no power to make him say things. It is said that perhaps the Prophet said it, while he was reciting, by way of rebuke for the unbelievers in the same way that Ibrahim said, “This is my Lord,” (6:76) according to one of the interpretations and as Ibrahim also said, “Rather the greatest of them did this.” (21:63) After a silence and then a clari fication of the words, he returned to his recitation. This is possible if the sepa ration was clear and the context indicated what was meant. In this case what he said was not part of what is recited. This is one of the things that Qadi Abu Bakr has mentioned. There is no argument against this interpretation in what is related about him being in the prayer. It is not impossible that the words occurred before the prayer. 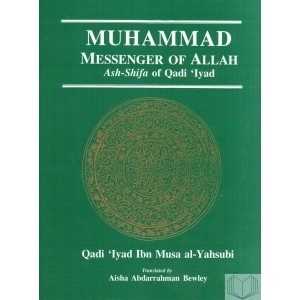 That which appears to be true in Qadi Abu Bakr’s opinion, and that of oth ers among precise people who hold the same opinion, regarding the interpreta tion of this hadith, if indeed it is sound, is that the Prophet was reciting the Qur’an slowly as his Lord had commanded him to, making the ayats distinct and precise in his recitation as has been reliably related about his practice. It was possible that Shaytan was lurking nearby and during the silence slipped in different words which were attuned to the voice of the Prophet, so that the unbelievers present thought that the Prophet had said them and so publicised them. As far as the Muslim is concerned, this does not impair the preservation of the sura, which occurred before that incident, as Allah revealed. They were certain about the Prophet’s censure of idols. Musa ibn ‘Uqba related something similar in his book The Raids, saying that the Muslims did not hear these words. Shaytan cast them into the ears of the idol-worshippers and into their hearts. What is related about the Prophet’s sor row was because of the publicity given to the incident and the uncertainty which made it a cause for trial. Allah says, “We did not send any Messenger or Prophet before but that Shaytan cast into his fancy when he was fancying…” (22:52) “Fancying” here means recitation. Allah also says, “They only know fancies of the Book,” (2:78) i.e. recitation. He further says, “Allah will abrogate what Shaytan cast,” (22:52) meaning, take it away and remove all doubt concerning it and make the ayat clear. It has been said that the ayat means that a state of forgetfulness came over the Prophet when he was reciting and then he became conscious of it and returned from it. This is roughly what al-Kalbi was indicating about the ayat, when he said that he was speaking to himself, taking “when he was fancying” to mean “was speaking to himself.” Something similar to this is related in the transmission of Abu Bakr ibn ‘Abdu’r-Rahman. This forgetfulness in the recitation is valid only if it in no way alters the meaning, changes the phrases or adds something that is not part of the Qur’an. It might constitute omitting an ayat or a word of it. However, the Prophet never remained in this state of forgetfulness. He was conscious of it and reminded of it immediately as we will mention when discussing what sorts of forgetfulness are permitted for him and what are not. By this Allah denies their assertion. It is correct to hope for intercession from the angels. When the idol- worshippers interpreted it as referring to their gods, Shaytan made it ambigu ous to them, decked it out to them in their hearts and cast that impression into them. Then Allah abrogated what Shaytan cast and made His ayat clear and cancelled the recitation of the two phrases which Shaytan had been able to make unclear, in the same way that many other parts of the Qur’an were abro gated and their recitation cancelled. Another explanation is that when the Prophet recited this sura and reached the mention of al-Lat, al-‘Uzza and Manat, the third, the other, the unbelievers feared he would bring something that censured them and they preceded him in praising them with these words. They then mixed them in with the recita tion of the Prophet and publicised it as was their custom.